The Apostle Paul writes in Romans 1:1 and Galatians 1:10 the following, Romans 1:1 Paul, a bond-servant of Christ Jesus, called as an apostle, set apart for the gospel of God (NASB) Παῦλος δοῦλος Χριστοῦ Ἰησοῦ, κλητὸς ἀπόστολος, ἀφωρισμένος εἰς εὐαγγέλιον θεοῦ, Galatians 1:10 For am I now seeking the favor of men, or of God? Or am I striving to please men? If I were still trying to please men, I would not be a bond-servant of Christ. (NASB) Ἄρτι γὰρ ἀνθρώπους πείθω ἢ τὸν θεόν; ἢ ζητῶ ἀνθρώποις ἀρέσκειν; εἰ ἔτι ἀνθρώποις ἤρεσκον, Χριστοῦ δοῦλος οὐκ ἂν ἤμην. Here Paul speaks of being a bond-servant to Yeshua the Messiah in Romans 1 and connects this to seeking the favor of men verses the favor of God in the context of the bond-servant in Galatians 1. The connection to the Torah by what Paul is saying is found here in Parashat Mishpatim. In Shemot / Exodus 21:5 ‘But if the slave plainly says, ‘I love my master, my wife and my children; I will not go out as a free man,’ 21:6 then his master shall bring him to God, then he shall bring him to the door or the door-post. And his master shall pierce his ear with an awl; and he shall serve him permanently. ה וְאִם-אָמֹר יֹאמַר הָעֶבֶד אָהַבְתִּי אֶת-אֲדֹנִי אֶת-אִשְׁתִּי וְאֶת-בָּנָי לֹא אֵצֵא חָפְשִׁי: ו וְהִגִּישׁוֹ אֲדֹנָיו אֶל-הָאֱלֹהִים וְהִגִּישׁוֹ אֶל-הַדֶּלֶת אוֹ אֶל-הַמְּזוּזָה וְרָצַע אֲדֹנָיו אֶת-אָזְנוֹ בַּמַּרְצֵעַ וַעֲבָדוֹ לְעֹלָם:. There are a lot of things that are covered here in Parashat Mishpatim. The Torah portion begins speaking of the issue of debt and if it happens that a Hebrew man sells himself into slavery in order to get out of debt. The Scriptures say 21:2 “If you buy a Hebrew slave, he shall serve for six years; but on the seventh he shall go out as a free man without payment. (NASB) The Text goes on to speak of a situation when a slave desires to remain with his master and chooses to become a permanent slave (Shemot / Exodus 21:5-6, ה וְאִם-אָמֹר יֹאמַר הָעֶבֶד אָהַבְתִּי אֶת-אֲדֹנִי אֶת-אִשְׁתִּי וְאֶת-בָּנָי לֹא אֵצֵא חָפְשִׁי: ו וְהִגִּישׁוֹ אֲדֹנָיו אֶל-הָאֱלֹהִים וְהִגִּישׁוֹ אֶל-הַדֶּלֶת אוֹ אֶל-הַמְּזוּזָה וְרָצַע אֲדֹנָיו אֶת-אָזְנוֹ בַּמַּרְצֵעַ וַעֲבָדוֹ לְעֹלָם:). The Torah goes on to discuss personal injuries in the sense of a man striking another man (Shemot / Exodus 21:12-26). Moshe wrote about property rights related to sheep and oxen (Shemot / Exodus 22), vineyards and planted fields, paying back for damages to a neighbors land, etc. Moshe goes on to discuss Sorcerers (22:18), sacrificing to other gods (22:19), lending money (22:25-26), bearing false witness (Shemot / Exodus 23), the Shabbat rest for the land (23:10-12), National feasts (23:14-19) and the Angel of the Lord that goes before His people (23:20-33). These words of the covenant are sworn to by all of God’s people, and seeing the Lord is paralleled to walking in God’s ways of mercy, justice, righteousness, and truth. If one does not walk in God’s ways, he will not see God. This is connected back to the beginning of the Torah portion of one having a desire to become a permanent member of a family as a slave. אל הדלת או אל המזוזה, “against the door or door-post of the courthouse; we find an example of this in Deuteronomy 17,5: והוצאת את האיש ההוא אל שעריך, “you are to take out that man to your gates, (court);” This procedure is designed to give publicity to the irrational behavior of this Jewish “slave;” let all the people passing the courthouse know who it is that has preferred life as a slave with a gentile slave to life as a free Israelite. He will have no chance to escape this status before the next Jubilee year. This suggests the city gate is the location of the court where justice and truth are determined. The idea here is in relation to the one who makes this life changing decision does so publicly. Chizkuni states this is irrational behavior. In the sense of one getting out of debt, one would want to be free afterwards. Such a person however wishes to remain with his master and to become a permanent member of the family through servitude. Rashi interprets this verse in the following way. ועבדו לעלם AND HE SHALL SERVE HIM FOR EVER — This means until the Jubilee. Or, perhaps this is not so, but לעולם means for ever as is its usual meaning? Scripture however, states, (Leviticus 25:10) “[And ye shall sanctify the fiftieth year and proclaim liberty throughout all the land unto all the inhabitants thereof] and ye shall return every man unto his family”. A comparison of these two passages tells us that a period of fifty years is termed עולם. This does not, however, imply that he has to serve him a whole period of fifty years, but that he has to serve him until the year of the Jubilee (the fiftieth year) whether this be close at hand or far ahead (Kiddushin 15a; Mekhilta d’Rabbi Yishmael 21:6:6). 21:5 ‘But if the slave plainly says, ‘I love my master, my wife and my children; I will not go out as a free man,’ 21:6 then his master shall bring him to God, then he shall bring him to the door or the door-post. And his master shall pierce his ear with an awl; and he shall serve him permanently. (NASB) ה וְאִם-אָמֹר יֹאמַר הָעֶבֶד אָהַבְתִּי אֶת-אֲדֹנִי אֶת-אִשְׁתִּי וְאֶת-בָּנָי לֹא אֵצֵא חָפְשִׁי: ו וְהִגִּישׁוֹ אֲדֹנָיו אֶל-הָאֱלֹהִים וְהִגִּישׁוֹ אֶל-הַדֶּלֶת אוֹ אֶל-הַמְּזוּזָה וְרָצַע אֲדֹנָיו אֶת-אָזְנוֹ בַּמַּרְצֵעַ וַעֲבָדוֹ לְעֹלָם:. ΕΞΟΔΟΣ 21:5-6 21:5 ‘But if the slave plainly says, ‘I love my master, my wife and my children; I will not go out as a free man,’ 21:6 then his master shall bring him to God, then he shall bring him to the door or the door-post. And his master shall pierce his ear with an awl; and he shall serve him permanently. (NASB) 21:5 ἐὰν δὲ ἀποκριθεὶς εἴπῃ ὁ παῖς ᾿Ηγάπηκα τὸν κύριόν μου καὶ τὴν γυναῖκα καὶ τὰ παιδία, οὐκ ἀποτρέχω ἐλεύθερος· 21:6 προσάξει αὐτὸν ὁ κύριος αὐτοῦ πρὸς τὸ κριτήριον τοῦ θεοῦ καὶ τότε προσάξει αὐτὸν ἐπὶ τὴν θύραν ἐπὶ τὸν σταθμόν, καὶ τρυπήσει αὐτοῦ ὁ κύριος τὸ οὖς τῷ ὀπητίῳ, καὶ δουλεύσει αὐτῷ εἰς τὸν αἰῶνα. The Greek word used here δουλεύσει (verb 3rd sg aor subj act epic) means “to be a slave” in this sense of αἰῶνα “forever.” In the Apostolic Writings, the word δοῦλος means a slave, bondman, man of servile condition. This word also metaphorically refers to one who gives himself over to another’s will. This illustrates the “Servant attitude” of causing one to devote his life to another disregarding one’s own interests in exchange for the person he has sworn to. Galatians 1:10 Ἄρτι γὰρ ἀνθρώπους πείθω ἢ τὸν θεόν; ἢ ζητῶ ἀνθρώποις ἀρέσκειν; εἰ ἔτι ἀνθρώποις ἤρεσκον, Χριστοῦ δοῦλος οὐκ ἂν ἤμην. It is within this context that Paul is speaking, of loving his master and therefore having signed over all of his personal ownership rights to another, to Christ. These things are connected back to Parashat Mishpatim through the Hebrew slave who wants to make himself a permanent slave to his master saying, “I love my master, my wife and my children; I will not go out as a free man.” (Shemot / Exodus 21:5) Rashi states the following regarding these verses. אל הדלת או אל המזוזה TO THE DOOR OR TO THE DOOR-POST — From this statement you might think that the door-post is also a proper thing upon which the servant’s ear may be pierced! Scripture, however, states, (Deuteronomy 15:17) “[Then thou shalt take an awl], and thrust it through his ear and into the door” — into the door but not into the door-post. If this be so, what is the purpose of Scripture stating here “[to the door] or to the door-post”? By this juxtaposition it only compares the door with the door-post. What is the characteristic of the door-post? It is something perpendicular! So, too, the door must during the act of performation be in a perpendicular position (on its hinges), not detached as, for instance, lying on the ground (Mekhilta d’Rabbi Yishmael 21:6:2; Kiddushin 22b). Rashi speaks on the Hebrew Scriptures which say, אֶל-הַדֶּלֶת אוֹ אֶל-הַמְּזוּזָה “upon the door or upon the door-post.” Rashi draws together these two words (הַדֶּלֶת, הַמְּזוּזָה) “door-post” and “door,” both of which are upright in the sense of standing upright. For God’s people, throughout history, persecution, mockery, oppression for our faith and standing for the truth have been a reality. In this case here, in the servant who chooses to bond himself permanently with his master, he is publicly making a covenant with God and with man. What this involves is proclaiming the truth of God’s Word according to His Torah, in the testimony of the servant making public his intentions to become a permanent servant. The idea here then reveals to us how when a person proclaims his intentions about Yeshua the Messiah, he is called to tell everyone about what he has done. This proclamation is paralleled here in Parashat Mishpatim in the servant who makes himself to be a permanent bond-servant is going to the city gate and make this known (proclaiming) his intentions for all to see. The idea of going into all the world and speaking/teaching the gospel message is a very Torah centric principle. This parallels Yeshua’s words in Mark 16:15 says, “And he said to them, ‘Go into all the world and proclaim the gospel to the whole creation.’” Paul wrote in Romans 1:16-17, “For I am not ashamed of the gospel, for it is the power of God for salvation to everyone who believes, to the Jew first and also to the Greek. For in it the righteousness of God is revealed from faith for faith, as it is written, ‘The righteous shall live by faith.’” In order to stand up for the truth we must share the message of God’s deliverance with the world. This appears to be what is taking place in the command on becoming a permanent servant, and in Rashi’s words comparing the door-post as being upright. The One who brings his life before God and men is to do so being upright, righteous, and with good intentions. Notice how Rashi draws in the interpretation on the piercing of the ear to the one being cleansed of leprosy (Vayikra / Leviticus 14:25, a disease only God could heal), Stealing (Shemot / Exodus 20:13), to selling one’s self due to debt (Vayikra / Leviticus 25:55), saying the door and door-post are eye witnesses in Egypt during the Passover and the blood of the Lamb (Vayikra / Leviticus 25:55), and to the man who voluntarily prolongs his state of slavery (Talmud Bavli Kiddushin 22b). 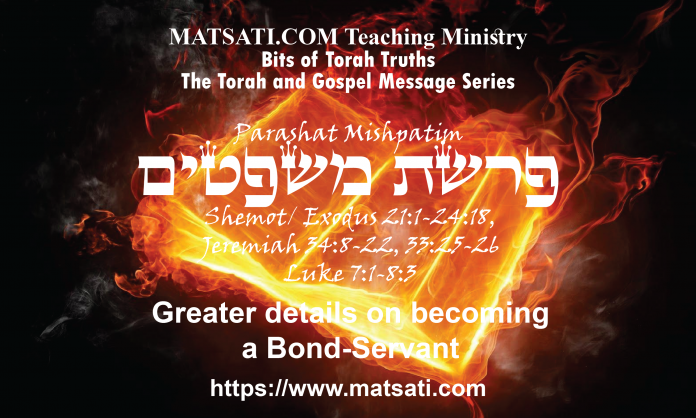 This is a very interesting grouping of concepts together in the commandment on becoming a bond-servant of the master. It is not very difficult to extract a NT teaching on having faith in the Messiah Yeshua and being cleansed, having our debts paid, making a visual covenant with God before God and men, the witness of the Passover, our voluntarily becoming a servant of the master permanently, and then going into all the world and proclaiming the good news of the Messiah! Traditional Christian views on the Torah and the rabbinic literature however make it difficult to understand Yeshua and his disciples teachings. Studying the Torah and the Rabbinic literature without prejudice it becomes abundantly clear how the Torah and the Gospel message are tightly coupled. In fact, the two are inseparable!